Measuring performance within your safety program is often seen as an afterthought. Yes, you may have some performance indicators in the back of your mind when you started your aviation SMS implementation program, but these performance measurements may have been in the form of "number of findings that external auditors hit us with," or "how much money can we save by implementing an aviation safety management system?" Company performance measures provide a means for communicating goals, objectives and for motivating your company to achieve a common purpose. So what are your key performance indicators? Many safety managers have no idea what performance indicators are important to their airline or airport. A few don't even know what is a performance indicator. So let's start with the basics. Performance indicators are elements within your company that provide key information on progress toward accomplishing the mission or profitability. Most airlines and airports share the same performance indicators, but few airlines or airports believe the exact same set of performance indicators are import for achieving the mission. These key performance indicators are what provide a company with its common mission and also drive the short term objectives. Without company performance measures, there would be no way to judge whether the overall company mission remains successful. How can you compare your performance with an industry standard without company performance measures? Company performance measures are instrumental in setting company goals that can be communicated throughout the organization. When company employees see which company performance measures are valued by top management, then the company becomes more capable of channeling synergistic energies to achieve common goals. Company performance measures may be compared to regional, national and/or industry standards to determine whether the company is competitive or to measure operational effectiveness. In these cases, the company performance measures of interest will become key performance indicators. What Is Process Performance Monitoring in Aviation Safety Programs? Process performance monitoring focuses not on single inputs or outputs, but on measuring the "process." Examples may be in order here to illustrate this often misunderstood concept. Performance indicators are usually seen as discrete, measurable elements, such as number of aviation related accidents and incidents in last six months, number of bird strikes in past year or number of customer injuries within the past month. These numbers illustrated are focusing on measuring events, whether they are accidents, incidents or irregularities. Process performance monitoring focuses on measuring the performance related to managing these accidents, incidents and irregularities. Process performance monitoring also has performance indicators. These performance indicators serve the same purpose of communicating goals and objectives, initiatives to improving performance and comparing with other companies to deter me operational effectiveness. In your aviation safety management program, you may consider process performance monitoring more important after you have started collecting data, such as six months to a year after you started implementing your aviation safety management system. When considering process performance monitoring in your organization, don't be too concerned whether your processes are key performance indicators. Focus on the process. As you can easily see, these metrics are focusing on measuring the safety system processes. Why Process Performance Monitoring Is Important? If you cannot easily review your current operating performance measures, then it is highly unlikely that your company sets goals. Performance measures in an organization provide guidance to management for goal setting and performance. Every safety manager should be asking themselves "What are the performance indicators in our company?" Hopefully some of your key performance indicators are based on process performance. When a company monitors their process performance, they become more responsive to clients and stakeholders. Quality usually improves. Monitoring safety performance will help improve organizational safety. So which processes should you be monitoring? Examples could include days to complete certain tasks, number of reported events, number of overdue tasks and corrective preventive actions, etc. Process performance monitoring is important because you can detect whether your organization is improving. Without measuring performance there is no way to set meaningful goals and objectives. Furthermore, process performance monitoring allows upper level managers to determine whether the other managers are supporting the mandated safety initiatives. When you witness your performance measures declining, you will be able to investigate into the root cause of the decline. Who Prepares Performance Management Policy? If your company does not have a performance management policy, then you should hurriedly draft one and present the policy to top management. Performance management policies need the support of top management. Start at the very top. Get approval from the accountable executive to make your task easier. Relate to management the benefits of process performance monitoring and how organizational safety will improve when your company actively engages in the performance measurement process. Some companies may have an existing performance management policy for other operational divisions, such as quality or accounting. In these cases, upper management is less resistant to the inclusion of the performance management policy from the safety department's perspective. Your performance management policy should include a section on the frequency of safety performance monitoring. Safety performance monitoring should be performed by the safety committee at least once each month. Another section to include in this policy is how often upper management should gather to review the performance measurement framework you have established to determine the effectiveness of the framework. How to Measure Performance in Aviation Safety Programs? 2) Use a centralized database to collect data and generate real time reports. SMS Pro measures performance automatically. Reports are real time, meaning that data is fresh each time you visit the performance monitoring tools. SMS Pro has many key performance indicators that are automatically tracked. A sample of these performance indicators is listed at the end of this article. When Does Performance Measurement Process Begin? The performance measurement process begins immediately after you start your aviation SMS implementation process. The clock is ticking and there are many performance indicators to begin goal setting and performance monitoring. Examples to begin focusing on may include setting goals for implementing the elements in your SMS implementation plan. Setting goals and and consistently measuring progress can be fun and increase involvement in your aviation safety program. There are many ways to measure organizational performance. SMS Pro has many tools that fall under risk management and safety assurance to assist your organization in developing performance measures. Performance Monitor provides management with a snapshot of how their SMS is performing. ICAO mandates that at a minimum, operators must have an SMS that "Provides for continuous monitoring and regular assessment of the safety level achieved." SMS Pro's Performance Monitor allows management an easy way to continuously monitor their SMS program. SMS Pro's Performance Monitor includes key performance indicators such as hazard reporting, risk management, costs, time to close issues, etc. In addition, the Performance Monitor includes trending charts, tables, percentages, etc. Default key performance indicators allow top management to quickly see how their safety management system is affecting their operations. Executives are typically not interested in going into the weeds, therefore, the Performance Monitor was developed specifically for them. SMS Pro's Performance Monitor allows executives to see reported activity in real time! 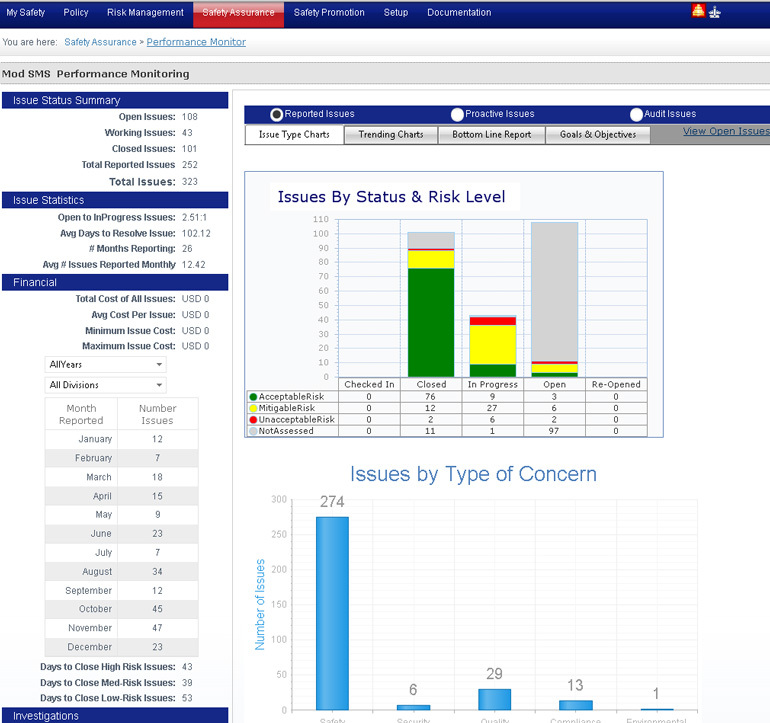 One can quickly see how open is the reporting culture by looking at this Performance Monitoring module. In addition, looking at the average number of days an issue is unresolved is a good metric for organizational responsiveness.